This is only my second year making cider, so I suppose it’s no huge feat that this is my “best year yet”. Still, it’s exciting, hugely rewarding and ultimate proof of the value of a little note-taking. I’ve been pretty lucky with my current living situation: I live in a converted barn called “Orchard Cottage”, so called because there’s an apple orchard literally in my back yard. 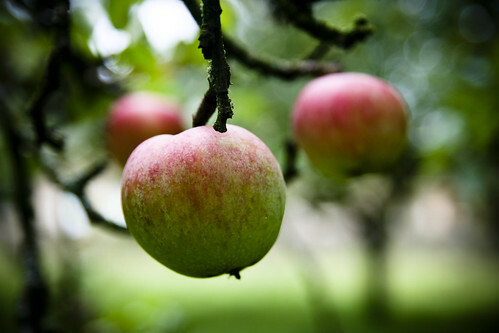 Anyone who has apple trees knows that one of the year’s most entertaining challenges is making use of an apple glut. 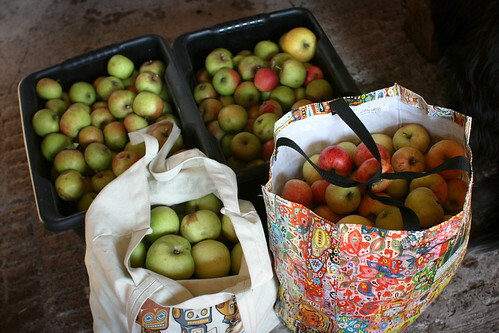 For the past two years, I’ve been using my deluge of apples to make my own cider. 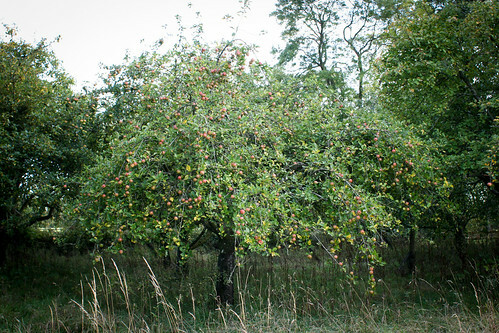 Why make cider? It’s fun, fascinating, delicious and, if you’ve got the apples, relatively cheap – all you need are some demijohn containers and some airlocks, available at any decent homebrew shop (I bought demijohns and airlocks – the bare minimum to get started – at West Wilts Home Brew, then later ordered a siphon, hydrometer and funnel from The Home Brew Shop). Commercial cider is made with “cider apples” but you can do this with whatever apples you have around, including Bramley apples, crab apples, eating apples or a combination of what you have on hand. In fact, part of the fun is experimenting with different apples and comparing the results. You also need a cider press to juice those apples, but this is where your friends come in – no matter where you live, chances are someone in your community has a cider press, which is really at the heart cider’s beauty: it brings people together for the greater good (and alcohol!). 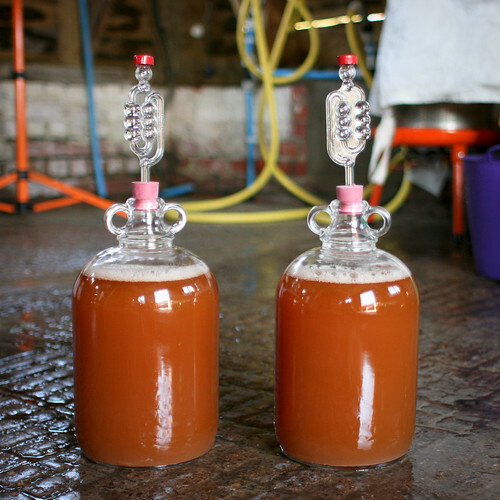 The process of making cider is pretty easy: make juice and leave it to ferment. Boom. You have cider. 1. Collect a bunch of apples. 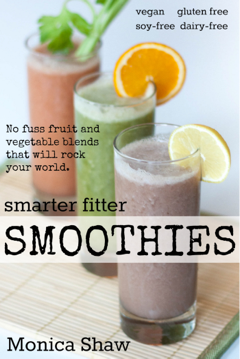 This requires first pulping the apples and then pressing the pulp into juice. If you can find someone with a good electric mill and industrial press, become their best friend – chances are anyone who is enthusiastic enough about cider to own these devices is going to be pretty swell by default. 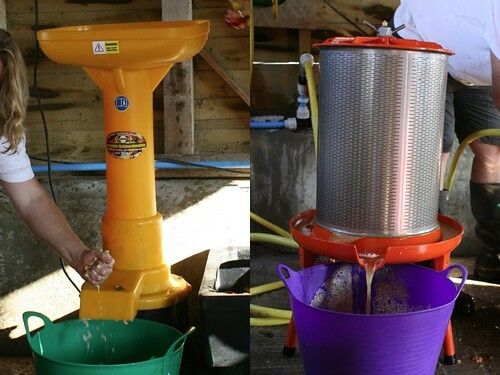 These new apple presses are much quicker, cleaner and easier than traditional apple presses. This means less time press and more time talking and tasting! Last year, I found such a press at Court Farm in Somerset, a holiday cottage that also has an apple orchard and offers a self-pressing service. This year I stayed closer to home and pressed apples the old-fashioned way. Let’s just say, once you go New School apple pressing, you can never go back. 3. Put the juice in a container with an airlock (a device that keeps the air out while still letting carbon dioxide, a bi-product of fermentation, escape). 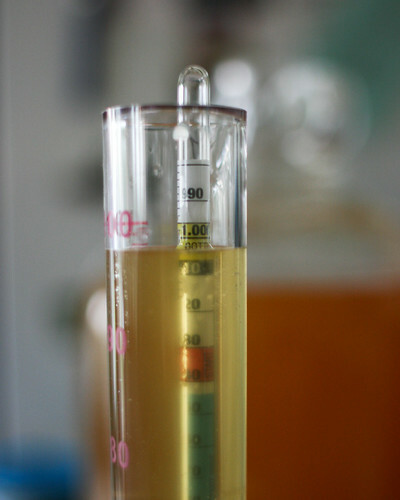 Bonus step: use a hydrometer to measure the amount of sugar in your apple juice; this will give you a rough gauge of how alcoholic the resulting cider will be. 5. Pour the liquid into a new container, leaving most of that sediment behind (this is called “racking off”, and a siphon is handy for this). 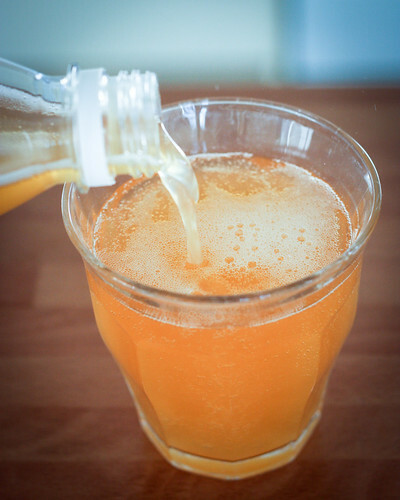 You can add a bit of sugar if you’d like for a sweeter cider. This starts off a secondary fermentation cycle. 6. After a few more weeks, you can drink the cider, or add a little more sugar and pour it into bottles (swing-top glass bottles or plastic screw-top bottles are best). Seal the bottles and let the cider sit for a few more weeks, during which time it will get all carbonated and bubbly. There’s nothing like ice cold sparkly cider on a warm day, and you get to use the cool phrase “bottle-conditioned”! I’ve hugely simplified the process, and you can get super nerdy about the chemistry of it all, but this too is part of the fun. 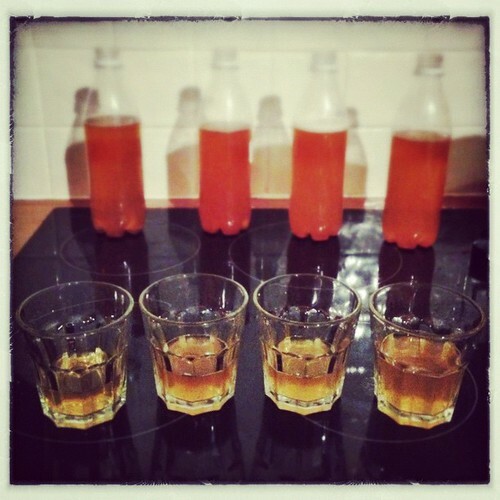 This year I experimented with varying the amount of added sugar to my cider and produced a range of results, some very dry, others almost Magners-esque, all brilliantly fizzy and almost dangerously drinkable. In a blind taste test, I decided my favourite was the batch that got a dose of sugar after being racked off, and another dose at the bottling stage. If you’re keen to give cider making a go, I recommend picking up a copy of Real Cider Making on a Small Scale by Michael Pooley and John Lomax which is full of useful advice for newbies, including an indispensible flow chart that really simplifies the whole process. It also gives very clear directions on how much sugar to add at the different stages to achieve the type of cider you want (dry, medium dry, sweet, etc). 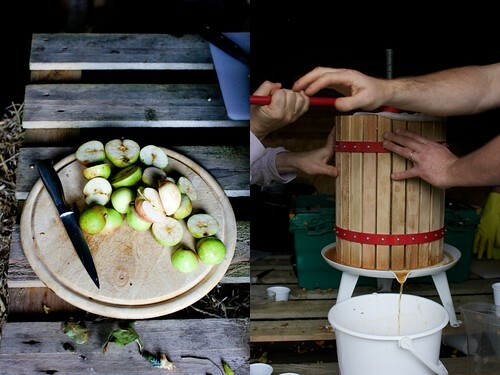 And if you really want to get into the nerdy biochemistry side of things, Andrew Lea’s Craft Cider Making is essential. So, who wants a taste? 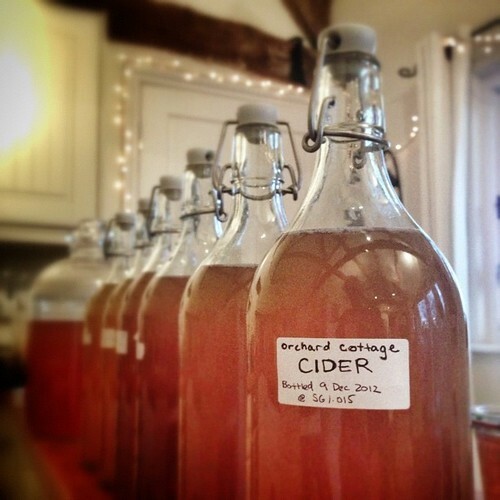 Shameless airbnb plug: Guests at Orchard Cottage get to sample my brew – this could be you! Click here for more info. Monica! 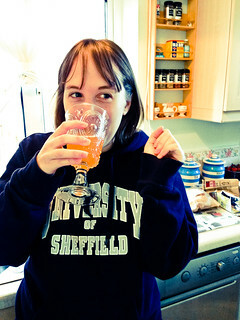 I didn’t realise you were a cider lover too! I’m a HUGE fan. 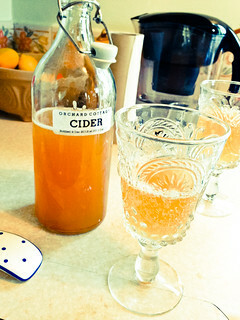 Also, Mr Neil makes his own cider on a regular basis. Snap! I relished every word of this post! So facsinating…. there is so much to love about where you live. 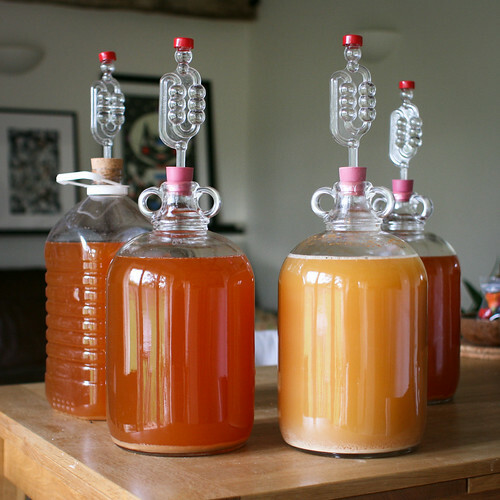 Cider making is not all that common where we live…. Oh but I bet you could create something just as luscious with those pineapple guavas. Maybe something more in the cocktail ilk? Or fruit vinegar? ?